So, last month I was finishing up a book on Abraham Lincoln ghostlore, and found myself in the old familiar microfilm room at the Harold Washington library, digging through old issues of the Chicago Times, the Copperhead anti-Lincoln paper whose editor, Wilbur F. Storey, would have made a great cable news loudmouth. 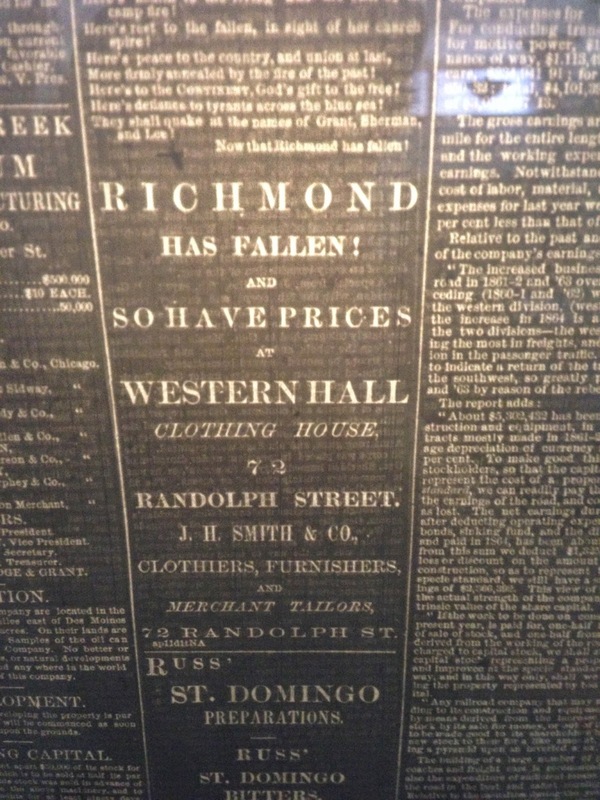 While combing through the April, 1865 issues from the time when Richmond was taken back from the rebels, I found this fantastic ad for a clothing store. It’s like something you’d see on The Simpsons. Here’s to the continent, God’s gift to the free! here’s defiance to tyrants across the blue sea! They shall quake at the names of Grant, Sherman and Lee! now that Richmond has fallen! Well, gosh. It’s been a few weeks since we had an HH Holmes story to tell. 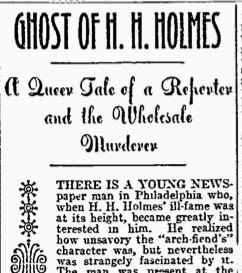 But here’s a nifty one: in 1899, the Philadelphia Inquirer told an interesting ghost story about Holmes. It was in Phillie that Holmes had been imprisoned, tried, hanged, and buried, and the Inquirer covered the story very well (they were not, as is often claimed, a Hearst-owned tabloid). According to the story, one young newspaperman in Philadelphia who attended the trial took a liking to Holmes – he knew he was a murderer and all, but found him impossible to dislike personally. “Well, fellows (the reporter went on), I felt rather queer until (the date of the execution). At five minutes of 1 I took my post in the center of the court. I felt foolish and frightened alternately, and as the minutes passed you could have heart my heart beating. After what seemed an hour, the strokes of the clokc began. One, two, three…and just on the twelfth, I saw a little yellow dog come running half sideways into the west corridor. It came straight toward me, and I remember that I was shaking all over with excitement, and I made two or three fumbles at a stone I reached for before I got it. Almost as carefully as I could, I shied it at the dog, which was then about twenty feet off. It hit the cur square on the head, and with an almost human yelp, he turned and ran. Whether any of the story is true, not just a tall tale the young newspaperman liked to tell, is probably anyone’s guess. It may be that Holmes knew that a dog was in the habit of running into the center of the court when the clock struck and wanted to mess with the guy. It may have been that the whole thing is pure bunk. But I’m sure there are those who believe that HH Holmes really did come back as a dog, only hours after his death! The Frosty Files: A Holiday Classic by Adam Selzer.